Do your homework if you talk about being agile! Many of the professionals working in the agile and lean field just don’t believe the current sitting CEO’s, Boards and executives can lead the ongoing digital transformation and turn companies agile, adaptive, flat and open. Do you believe an executive, who has been leading with a certain (industrial) thinking pattern, suddenly can turnaround their whole way of conceptualizing the world together with their patterns of decision making, influencing and following up the business? Is it worthwhile to wait for the current executive to “get this scene”, or just better to wait for the X- and Y-gen leaders, who know the choreography for agile, to step up to the challenge? More importantly, does your company have the time to wait? As an executive or a member of the board you will find yourself in the situation where you need to decide on implementing a (scaled) agile way of working and experimental product/service development. How do I know this? Well, I bet your company sells products or services that somehow land within a domain of digital, software development, applications, IoT, artificial intelligence, media, communications, marketing, data, analytics, design or any R&D at all. These domains are rapidly moving into a new way and methodologies of working – agile and lean. Which leader is able to navigate in and support this enormous organizational change and in which order would activities take place? Writing about this would take a whole book, but I hope it is helpful to bust at least the most frequently heard misinterpretations and misunderstandings about agile (heard from executive level people). Agile does not mean “everyone are doing what they want”. Agile is not a way of working without objectives, rules or restrictions invented by some beard-growing-kale-smoothie-drinking-hipsterdevelopers. Agile methodologies bring on self-directiveness, customer value centricity, delivering incremental value, very much discipline, and cyclic order. This way of working is all different from the usual defining targets top-down, delivering a whole ready product to a deadline or following up according to the lovely annual clock and quarterly reports. The deepest meaning of agile needs to be clear to all the way up to the executive team and the board if you want to lead a digital business. Agile does not mean “unplanned”. On the contrary! Working with agile methods means teams are spending vast amounts of time planning, defining deliverables, agreeing on responsibilities, and presenting results with ongoing small changes, usually with the customer or using real user data. The difference is that instead of up front long-term planning the agile planning is done stepwise and incrementally, inviting the small inevitable changes along the way. Follow up is transparent, everything is visible down to the smalles task. As a small experiment of your own, why don’t you dig out the three year plans you made with your exe team three years ago and evaluate if the time was well spent on that planning. Agile is not a work for “flexible” or “flexible work”. It does not mean possibilities to do distant work (which is an ignorant word for any digital work anyways), flexible worktime, home-work balance, or that your company is designing a new modern multi-purpose office. Could we, pretty please, not use the word “agile” with this purpose. Anymore. Ever. This last one is such a tough cookie. Everyone within the agile scene are trying to get this little piece of a misunderstanding (“faster”), break it into crumbles and step on it, but it just does not want to die. The reasons, philopsophy and impact of agile is so much more. 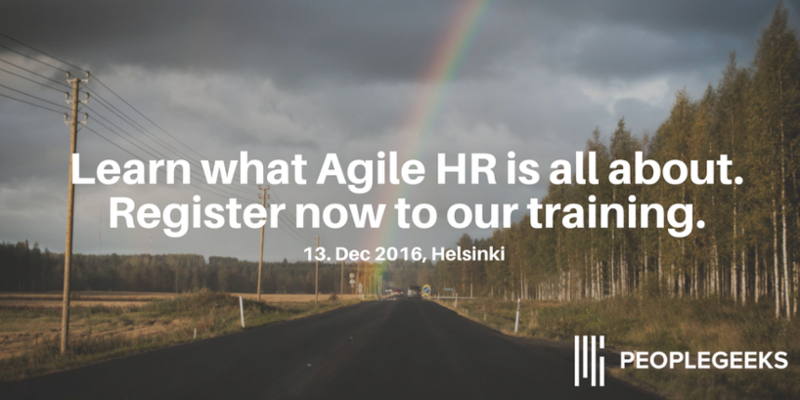 Agile is another way to think, work, organize, share, impact, lead, follow, decide, plan, develop, innovate and be. Starting to work according to agile should impact the company’s planning, reporting, follow up, budgeting, rewarding, decision making models, support functions, HR processes and especially the management and leadership practices, which require a 180 degrees transformation, really. The first steps towards a scaled and functioning agile organization is taken inside the executive team’s and the board’s own heads. You have the power to change the company structures into something that enables agile. There are several models, and many options. If you as an executive don’t know what agile means, if you don’t live and breathe it, I bet you can’t lead an digital transformation very successfully. Your ignorance on the subject will be felt in every transformation turn the organization tries to take. Not in a very helpful way, I assume. So, please do your homework well before talking about agile. We are happy to help you along your transformation. Peoplegeeks can help executive teams and boards understand the organizational (management, leadership and HR) implications of scaled agile work.